Accepta 0504 is a high performance molybdate / zinc based scale and corrosion inhibitor developed for use in cooling towers operating with softened water. Accepta 0504 is highly effective cooling tower maintenance product suitable for eliminating the corrosion potential of softened water. High stability polymers and scale inhibitors have also been incorporated into Accepta 0504 to help maintain extremely clean heat transfer surfaces through scale and corrosion prevention. 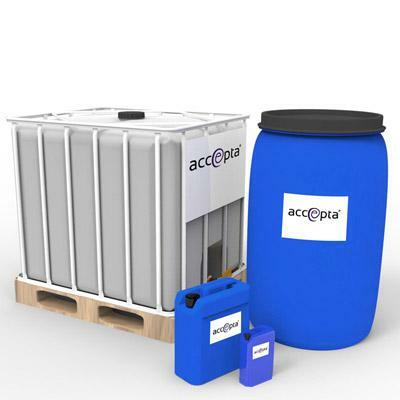 Accepta 0504 is stable over a wide range of operational conditions and water qualities commonly experienced in the operation of cooling towers (soft water). High performance scale and corrosion inhibitor for cooling towers. Suitable for soft water conditions. Formulated using one of the best scale inhibiting polymers commercially available. Contains a powerful corrosion inhibition package to protect against the corrosive properties of softened water. Ideal for improved control, the product level within a system can be measured using a simple reliable molybdate test. To passivate the system against corrosion initially, the cooling tower should be dosed at twice the normal dosing rate of Accepta 0504 for a period of approx. 5-6 days. Once this has been completed, treatment should be added to give 100-200 ppm Accepta 0504 in the system (5 – 8 ppm molybdate MoO4). For example, a cooling system operating at 4 cycles of concentration requires, typically, 25 – 50 ppm of product to be dosed to the make-up water. Proportional dosing is recommended. The water system can be controlled by measuring either molybdate reserve (5 – 8 ppm as MoO4) or phosphonate. Accepta 0504 should be fed continuously to any point of good mixing. Avoid feeding Accepta 0504 to stagnant areas where product concentration may become artificially elevated.